Phytophthora is a root rot disease caused by the fungi Phytophthora cinnamomi. It is a major cause of die back in native vegetation and has significant impact in gardens as well. The disease is likely to have been brought into Australia with European settlement and has become very widespread. Human activity is a major vector for spreading the disease, however the fungal spores are easily dispersed by runoff and flood waters, making it almost impossible to contain. The spores flourish in warm moist environments and has far greater impact in regions with high rainfall than it does in arid areas. The spores are able to remain dormant in soil or dead plant material for many years and in doing so can survive drought very well. Phytophthora root rot affects the roots of plants, and occasionally the stems. Often we are unable to detect its presence until the plant has started to die and may be beyond saving. The first sign can be the leaves of the plant drying out and turning yellow, in spite of soil available moisture. On closer inspection you may find that the small feeder roots of the plant have turned brown and rotted; a sure sign of root rot, and very likely Phytophthora. Phytophthora can be treated with a fungicide containing phosphite. Care should be taken as some plants are sensitive to high doses of phosphite, and phosphorous sensitive natives may be particularly vulnerable. Treating your garden soil with low doses of phosphite can be very beneficial if you have experienced root rot in your garden, but is best done together with improving your drainage. Ensuring your soil is healthy will also help plants to cope with small incidences of disease, including root rot. This means having good drainage, and incorporating well-rotted organic matter as compost. A dose of rock minerals can also help. This provides the nutrients needed for strong plant growth without using excess nitrogen which can cause weak growth. The rock minerals and organic matter act to improve the condition of the soil and buffer excess water, nutrients or pH issues which can cause additional stress for plants, making them more susceptible to disease. Even with the best soil preparation, some gardens will still struggle with root rot problems caused by Phytophthora. Planting Phytophthora resistant plants will make a huge difference in these gardens. Lomandras are native grass like plants which are often used in erosion control or public plantings due to their extreme hardiness. In these situations, additional care to protect them from Phytophthora is not always possible and unfortunately many lomandras have succumbed to the disease. 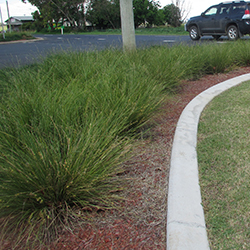 Some varieties of lomandra have proven to be highly resistant to Phytophthora and are therefore the ideal choice for planting in gardens and public spaces where drainage may be poor and Phytopthora is present. Resistant varieties are particularly well suited to areas which receive run off water, as Phytophthora is easily spread by water. The following lomandras are highly Phytophthora resistant and are ideal for planting in areas which receive water runoff. As with all lomandras, they have dense root systems making them hardy and ideal erosion control plants. 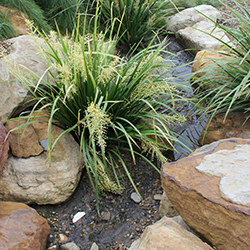 Katie Belles™ Lomandra hystrix ‘LHBYF’ PBR is the best performing, Australian native plant for use in rain gardens. It is ideal for mass planting in wet and dry landscapes, the edge of watercourses, drainage channels, and specimen planting. It is also a great option for erosion control. Katie Belles™ flowers abundantly with masses of perfumed flowers which are highly attractive to bees and other wildlife. It is highly attractive and well suited to ornamental gardens were flowers are desired. 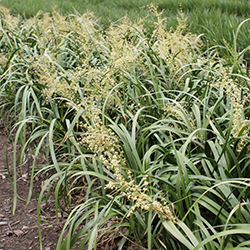 Lucky Stripe™ Lomandra hystrix ‘LMV200’ PBR is a tough reliable variegated plant even in humid climates. This plant is ideal for mass roadside plantings, rain gardens and is excellent for erosion control. It is a long lived plant that does not produce viable seed, so it will stay where it is planted. This very hardy variegated plant is great to provide contrasting effects in a garden. In addition to the above 3 lomandras which have shown very good Phytophthora resistance, the following 2 lomandras have shown complete resistance – with no deaths at all recorded in Phytophthora contaminated soils (at time of writing). Evergreen Baby™ Lomandra labill. 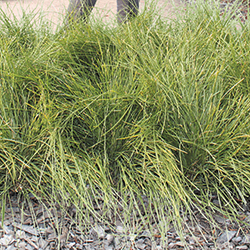 ‘LM600’ PBR is a very tough, compact Lomandra that is drought and wet feet tolerant. Many of the other compact forms of lomandra available are of L. confertifolia parentage which naturally occur in dry shade forests and do not have the ability to cope in hot or wet conditions. Evergreen Baby™ has L. longifolia parentage and is far tougher in hot or wet conditions, making it a very useful compact lomandra for gardens or public space plantings across much of Australia. Shara™ Lomandra fluvialtilis ‘ABU7’ PBR is a great fine leaf lomandra for humid landscapes and is the number 1 performing rooftop garden plant. The Shara™ plant is another good option for erosion control. This plant will tolerate periodic wet feet, but not permanent. 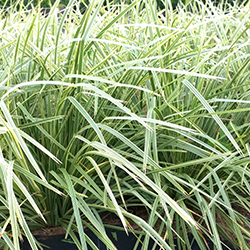 The fine leaf of this lomandra makes it an ideal choice as an alternative to ornamental grasses for gardens in humid or Phytophthora prone areas.